The Manifest Foundation and WorldVentures teamed up with Big Brothers Big Sisters to give four homes an Extreme Dream Makeover as part of a DreamDay volunteer effort. Words will never be able explain the emotional impact the first Manifest Foundation Extreme Dream Makeover has had on so many lives. Dallas-based Manifest Foundation and WorldVentures, in partnership with Big Brothers Big Sisters (BBBS), provided muscle and a lot of heart Jan. 26 to assist struggling families in Dallas with much-needed remodeling and updates to their homes. WorldVentures Representatives and employees raced against the clock to make over the homes of four BBBS “Littles,” during the daylong Extreme Dream Makeover DreamDay, which culminated in a “reveal” for each of the deserving families. The Manifest Foundation received more than $12,000 in donated materials from event sponsors, among them, Glidden, the Home Depot Foundation and ProSource Flooring. Volunteers spent the day painting; installing toilets, ceiling fans and carpeting; and doing general repairs on the homes. Their efforts were rewarded by tears and words of gratitude from each of the families. “This day has inspired a new year and a new me, we are extremely grateful,” said Extreme Dream Makeover DreamDay recipient Crystal Robinson. But the day of giving back also left the volunteers with a sense of thankfulness and optimism. 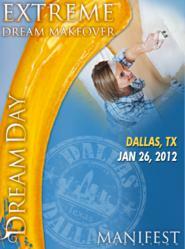 The Manifest Foundation plans to continue hosting DreamDays through its network of volunteers nationwide. Inspired by the vision and unparalleled commitment to improve the quality of life for children and families in underprivileged communities around the world, the Manifest Foundation was founded in 2010 by the WorldVentures executive team, a global travel and network marketing company. The Manifest Foundation is aligned with select nonprofit organizations, including Big Brothers Big Sisters, Hug It Forward, Youth Action International and the Nancy Lieberman Foundation, to build women’s empowerment centers and provide children with schools, one-on-one mentoring, and safe areas where they can learn and thrive. For more information, please visit http://www.manifestfoundation.org.